AMCTO has long provided a suite of publications and resources for its members and those working in Ontario's local governments. As a thought leader, these resoures focus on the advancement of local government management and leadership and seek to promote greater knowledge mobilization for professionals in the sector. Municipal Minute is a weekly e-newsletter that goes out each Wednesday to subscribers with recent local government news and updates of interest to professionals in the sector. 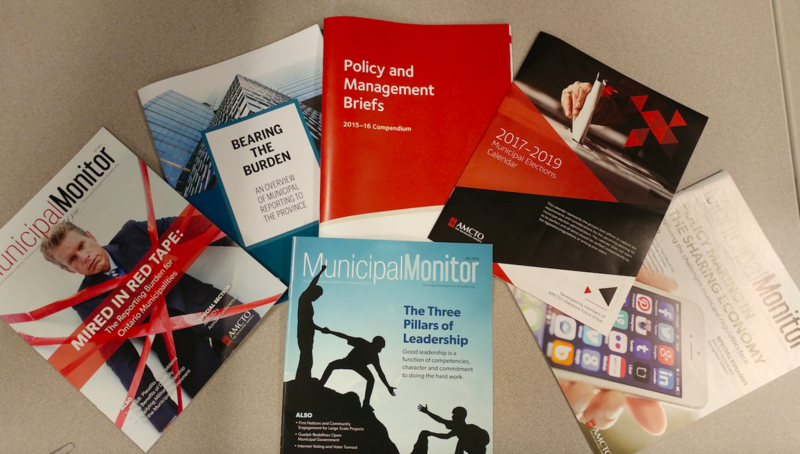 Municipal Monitor is a quarterly magazine produced by AMCTO that covers a range of management and leadership topics for professionals in the sector. It is available in both hard copy and digital versions. The Canadian Journal of Local Government is a publication AMCTO will help launch to promote greater academic and practitioner research on management and policy issues affecting local government. Ontario's Municipal Directory is produced annually by AMCTO and provides the most extensive list of municipal contacts for your respective business needs. Hard copy and an on-line version is available. The Accessibility Hub is a website delivered by AMCTO in partnership with the Accessibility Directorate of Ontario. The Hub is venue for sharing leading accessibility practices and a resource to communities in Ontario. Municipal Google Search Tool makes it possible to to search the full websites of Ontario's municipalities by using criteria like municipal size, zones and Government of Ontairo regions. You will find no more useful tool to access information about what is happening in Ontario's municipalities. Check back regularly for updates on new resources and publications.